Our Annual General Meeting (AGM) will be held on Saturday, 25 May 2019 at 4:00 - 6:00 p.m. Among the agenda items will be election of the six members of the Executive Committee (Excom) for a two year term of office. The AGM will be held at the 3rd floor Board Room of the Business Centre at the American Club, 10 Claymore Hill, Singapore 229573. For positions that receive nominations prior to the election for the said position, there can be no nominations from the floor of the meeting, as those voting via email will not have the same opportunity to vote for candidates nominated from the floor and voting will already be in process. For Excom positions for which no candidates have a been nominated, nominations may be made from the floor at the election meeting. Once all nominations are received, we will email all of the candidates’ statements of interest and a ballot to be reviewed prior to the election. •	Vote in person at the election meeting via paper ballot. •	Vote via proxy at the election meeting. Submit proxy form by Friday, 24 May. Please note that no proxy holder can have more than 2 proxies and proxy holders must be members in good standing of DA Lion City. The nominations committee will recommend eligible proxy holders to people who don’t know who to ask. •	Vote via email by Friday, 24th May, 2019.. Please send emails to Lisa Tucker-Kellogg at lisatk@gmail.com. Please note that you must be a member of Democrats Abroad 14 days prior to the election if casting your vote via email or proxy and 1 day prior to the election if casting your vote in person. Subsequent E-mails regarding other items on the Agenda for the May 25, 2019, AGM will be sent out by the Chair of DALCC in the near future. Directions for cars: Drive in past the gatehouse and then take a left turn up the hill. After the road bends back to the right, you'll see block A in front of you. Go into the block A elevator in front of you for units 5-8 (there's another elevator off to the side for units 1-4, but don't use that one). Take it up to the 7th floor and unit 5 will be on your left as you come out of the elevator. Please submit nominations and statement of interests via email to herro048@umn.edu no later than 14th April. Once all nominations are received, we will email all of the candidate’s statements of interest and a ballot to be reviewed prior to the election. Options for voting: (choose one): 1. Vote in person at the election meeting via paper ballot. 2. Vote via proxy at the election meeting. Submit proxy form by 4th May. Please note that no proxy holder can have more than 2 proxies and that the nominations committee will recommend eligible proxy holders to people who don’t know who to ask. Please note that you must be a member of Democrats Abroad 14 days prior to the election if casting your vote via proxy and 1 day prior to the election if casting your vote in person. The newly elected Member at Large will assume their duties after the election. What a difference voters make! We want to thank you all for voting and getting out the vote in the elections this week. Whether you attended our phone banks; made calls from home or with friends; posted on your Facebook page; liked our Facebook page so our election information could reach more members; or called folks from home and reminded them to vote, your efforts contributed to the tremendous success the Democrats had on Tuesday. We can't say it enough, voting and getting others to do the same is what makes the biggest difference! Tuesday was not just a great night for Democrats but it was a great night for America! In addition to winning both Virginia and New Jersey Gubernatorial elections, there were some stand out achievements that should be noted. Virginia elected Danica Roem to the House of Delegates, who will be one of the first openly transgender elected officials. Offended by a sexist post during the woman's march by New Jersey Freeholder John Carman, 32 year old first-time candidate Ashley Bennett decided to run against him and won! An unprecedented number of House of Delegate seats in Virginia were flipped by pro-choice women. Several women and minorities were elected around the country proving to the world what America is all about diversity and inclusion. There are more critical special elections coming up that we will be phone banking for. Shockingly, the special election for an open seat in the US Senate for Alabama is too close to call, despite the accusations of pedophilia by Roy Moore. Make sure all your Alabama voters friends and family get out to vote for Democratic candidate Doug Jones! If you have not signed up for our free online call portal please contact our Chairwoman Patricia Reed at sgp-chair@democratsabroad.org and she will help you get started. Most Americans aboard agree that we need to replace citizen-based taxation with territory based. Republicans Abroad are putting forward a proposal for this tax reform. Let's work in a bi-partisan manner to push this initiative. Please sign the petition here, or send a postcard (like the one below) by September 30th! Our current Vice Chair, Bill Gelman, has had to step down and we are currently seeking a replacement. Our by-laws stipulate that the Chair and Vice-Chair must be different genders, so we need a male to fill the position. To partner with the Chair and take on some of the responsibilities at the local, regional, and global level. For a detailed breakdown of these responsibilities click here. Be prepared to step in for the Chair if necessary. If you know anyone who would be willing to contribute to the Democratic cause in this manner, please reach out to Patricia Reed, Chair DALCC at sgp-chair@democratsabroad.org or Melissa Herron, Head of Nominations at herro048@umn.edu. A special election will be held on 22 August 2017 at 7 p.m. to fill our secretary position. It will be held at 5 Farrer Drive, Sommerville Grandeur Condominiums, 259279 in the community room. Please submit nominations and statement of interests via email to herro048@umn.edu no later than 5th August. If we receive nominations for this position prior to the election, there can be no nominations from the floor of the meeting, as those voting via email will not have the same opportunity to vote for candidates nominated from the floor and voting will already be in process. If there are no candidates for this office, nominations may be made from the floor at the election meeting. Vote in person at the election meeting via paper ballot. Vote via proxy at the election meeting. Submit proxy form by 21st August. Please note that no proxy holder can have more than 2 proxies and that the nominations committee will recommend eligible proxy holders to people who don’t know who to ask. See attached Proxy Form https://www.scribd.com/document/354267620/DA-Lion-City-Proxy. Vote via email by 21st August. Please send emails to Missy Herron at herro048@umn.edu. The newly elected Secretary will assume their duties after the election. 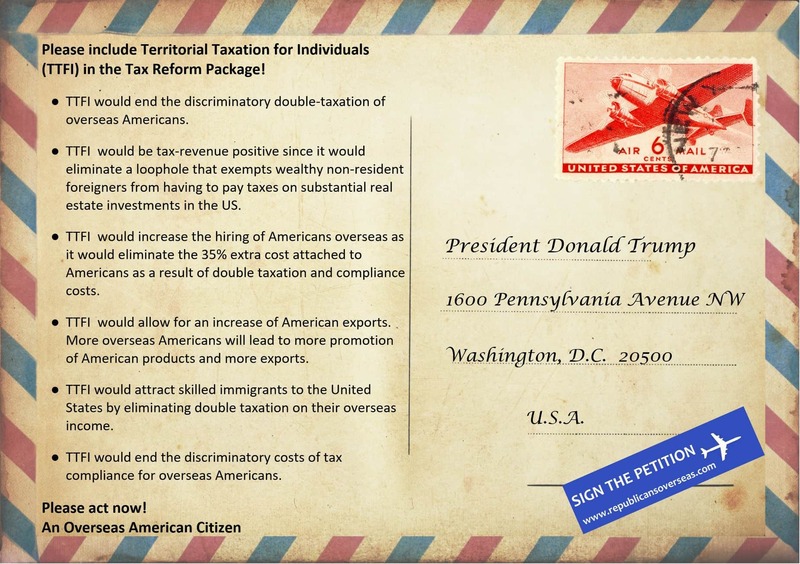 Democrats Abroad is hosting a global campaign urging Congress to shift from Citizenship Based Taxation to Residency Based Taxation. We are hoping that hundreds of thousands of Americans living right around the world will raise their voices in unison around June 15th, the tax return deadline for international filers, and demand that the package of tax reforms to be built by the 115th Congress includes a provision that ends mandatory reporting of offshore income by Americans that live outside the United States. We hope this ACTION PACK is useful for you to understand the issue and how to call, write or email your members of Congress asking for their support for Residency Based Taxation. Residency-based taxation (RBT) is a system in which you pay taxes according to the country in which you live, rather than the one in which you are a citizen. This latter system is known as citizen-based taxation (CBT). Every developed nation follows an RBT system, with one notable exception: The United States of America! The main rationale for such a system is that the benefits of U.S. citizenship follow Americans no matter where they live. Why is Citizen-Based Taxation a problem for overseas Americans? An estimated nine million U.S. citizens live, for numerous reasons, outside the U.S. CBT means that overseas Americans (who, together, make up a population greater than that of the U.S. state of New Jersey) face the financial and administrative burden of taxation in two nations. Many overseas Americans must pay expensive professional tax preparers to comply with complex and ever-changing tax laws and to keep them up to date on other new and changing reporting requirements. Most U.S. citizens living abroad are not rich “fat cats” who use overseas residency to “game” the system but rather are ordinary working Americans. Globalization means that the number of Americans living overseas will only grow with time. Increasing numbers of Americans living abroad are denouncing their citizenship as the costs of maintaining U.S. citizenship have become too high and do not justify whatever benefits they may have. Many areas of the tax code discriminate against Americans abroad: Double or punitive taxation can occur in the treatment of foreign retirement savings plans, capital gains, non-qualified, non-U.S. pension plans, and bequests to surviving foreign spouses, to give a few examples. The IRS outreach to overseas Americans has been woefully inadequate over time, and budget cuts have resulted in overseas IRS offices being closed, making the misinformation and confusion about U.S. tax filing even worse. State Department budget cuts mean fewer services for Americans abroad and longer wait times for appointments to renew passports or conduct other important business. How is Democrats Abroad participating in the efforts to bring about a change to RBT? Democrats Abroad has supported a change to RBT since its creation. Using its resources of thousands of dedicated volunteer activists, DA is working with other organizations of overseas Americans to campaign in support of RBT. Now that Congress is again turning its attention to comprehensive tax reform, DA believes that it has a genuine opportunity to influence the process. How can I help DA in its work on RBT? Remember, you have a voice! And that voice is best directed to your elected Federal lawmakers: The member of Congress and the senators of the district/state in which you last voted in the U.S. If you don’t know your member of Congress and/or your senators, you can look them up using these online tools. All you need is the zip code of the last place you voted in the U.S. There are also some Frequently Asked Questions on this page about how to contact your member of Congress. To find the address and phone number of your representative, look on the home page of their website, usually at the bottom. Sometimes this information is at the right hand side of the page. Clicking on the Senator’s name will take you to their website. To find the address and phone number of your Senator, look on the home page of the website, usually at the bottom. Sometimes this information is on the right hand side of the page. You also may find a “Contacts” tab at the top of the home page. Here are some concrete actions you can take to make your voice heard. Participate in the Congressional Call Storm – Thursday June 15! Organizations like DA sometimes plan “Congressional Call Storms” - an agreed day (and sometimes time period) for campaign participants to blitz Congress with phone calls about the same topic. The idea is to create a mass of calls that, literally, disrupt the day! See the sample script below. Even if you can’t participate in the Congressional Call Storm, you can call your member of Congress and senators at any time to express your views on RBT – as well as any other issues of importance to you! Here is a sample script for calling your representative or senator regarding RBT. Make changes as necessary so that it relates to your own situation! The phone will be answered by the office receptionist. I currently live in [city, country] and I am hoping to speak directly to the Senator/Representative or his/her staffer about a tax matter that impacts constituents like me who live outside the United States. I am calling to ask Representative/Senator _____________ to support Residency Based Taxation. As you may know, the U.S. is the only country that taxes its citizens on their world-wide income even when those citizens live abroad and no matter how long they’ve lived abroad. That means I pay taxes in [name of country] where I live, and I file a tax return to the IRS every year. IRS tax forms for declaring foreign income are a lot more complicated, so besides being a nuisance, filing abroad is complex, costly and very stressful. I’m an ordinary US citizen. I moved to [country] to [be with my partner/ be with my family/ to take an exciting job/ other]. I/my family cannot afford to be double-taxed. I’m/we’re not wealthy, with lots of disposable income to spend on tax return preparers. I value my US citizenship. I vote every year I can. I pay attention to U.S. politics as much if not more than the average citizen. But I don’t think it’s fair that I must pay taxes in [country of residence] as well as to the IRS. The current law is costly, punishing, and unfair and is causing many of us to consider renouncing our U.S. citizenship. I hope that shocks you because it shocks me. That is why I am asking Representative/Senator _________ to change the US tax laws from Citizenship Based Taxation to Residency Based Taxation. Can you please pass this message to Representative/Senator ________________ and ask her/him to support Residency Based Taxation. Thank you. Write your member of Congress or your senators! I vote in [state and district #]. My voting address zip code is [zip code]. I currently live in [city and country of residency]. As you may know, the U.S. is the only country that taxes its citizens on their worldwide income - no matter where they live and no matter how long they’ve lived abroad. Citizenship Based Taxation forces Americans like me who live abroad to report our income both to our country of residency and to the IRS. Many of us are double-taxed, and all of us endure costly, stressful and complex filing of overseas income – which is much more complicated than filing income generated in the US. The burden the law places on Americans living abroad is causing many to consider renouncing our US citizenship. This is intolerable. We are asking Congress to change the law from Citizenship Based Taxation to Residency Based Taxation. I ask for your support for Residency Based Taxation. I hope this has been helpful to you in understanding the serious and detrimental impact Citizenship Based Taxation has on the lives of ordinary Americans like me whose life happens to have taken abroad. I value my U.S. citizenship. I vote every year I can. I pay attention to U.S. politics as much if not more than the average citizen. But I don’t think it’s fair that I must pay taxes in [country of residence] as well as to the IRS. I vote in [city and state]. My voting address zip code is [zip code]. I currently live in [city and country of residency]. As you may know, the U.S. is the only country that taxes its citizens on their worldwide income - no matter where they live and no matter how long they’ve lived abroad. Citizenship Based Taxation forces Americans like me who live abroad to report our income both to our country of residency and to the IRS. Many of us are double-taxed, and all of us endure costly, stressful and complex filing of overseas income – which is much more complicated than filing income generated in the U.S. I hope this has been helpful to you in understanding the serious and detrimental impact Citizenship Based Taxation has on the lives of ordinary Americans like me who life happens to have taken abroad. Send a postcard to your member of Congress/senators! I vote in [state and district #]. My voting address zip code is [zip code]. I currently live in [city and country of residency]. Americans like me who live abroad are forced by the U.S. tax system of Citizenship Based Taxation to report our income both to our country of residency and to the IRS. The U.S. is the only country that taxes its citizens on their worldwide income, no matter how long they’ve lived abroad. I/my family am/is not wealthy. I/we cannot afford to pay tax in both the US and [country of residence]. The current law is costly, punishing, stressful, and unfair and is causing many of us to consider renouncing our U.S. citizenship. That is why we are asking Congress to change the U.S. tax laws from Citizenship Based Taxation to Residency Based Taxation. I ask for your support for Residency Based Taxation. Thank you. I vote in ___________ County, [State]. I currently live in [city and country of residency]. Americans like me who live abroad are forced by the U.S. tax policy of Citizenship Based Taxation to report our income both to our country of residency and to the IRS. The U.S. is the only country that taxes its citizens on their worldwide income, no matter how long they’ve lived abroad. I/my family am/is not wealthy. I/we cannot afford to pay tax in both the U.S. and [country of residence]. The current law is costly, punishing, stressful, and unfair and is causing many of us to consider renouncing our U.S. citizenship. That is why we are asking Congress to change the US tax laws from Citizenship Based Taxation to Residency Based Taxation. I ask for your support for Residency Based Taxation. Thank you. Participate in Democrats Abroad’s RBT Email Campaign! Democrats Abroad has initiated a campaign on the Democracy.io website, a platform for communicating with elected officials in both houses of the U. S. Congress. With Democracy.io, you can write an email message and send it automatically to both of your senators and to your member of Congress! The WeNeedRBT campaign link enables DA to track how many supporters of RBT have sent messages to Congress. Thanks for using this link and being counted in our campaign! I hope this has been helpful to you in understanding the serious and detrimental impact Citizenship-Based Taxation has on the lives of ordinary Americans like me who life happens to have taken abroad. DA Lion City Earth Day Postcard Campaign "Home Pack"
Democrats Abroad Lion City is commemorating Earth Day 2017 with an event on 22nd April that includes a post card campaign. We are sending them to elected representatives calling on them for greater action and commitment to environmental protection. We urge you to join us at the event and should you be unavailable to attend please consider preparing a post card, a letter or two to your elected representatives. Several sample texts are provided below for your convenience. I am a regular [district number] voter. I am writing from Singapore where I [or my spouse] am [is] on a temporary work assignment. Please vote NO on the REINs Act S.21, which would require congressional approval for any new rule from federal agencies. This would be a big hand out to special interests and prevent any meaningful regulations from being passed without massive gridlock. My parents are regular voters from [district number]. I am writing from Singapore where my [parents] are on a temporary work assignment. Please vote NO on Reins Act S.21, which would require congress to approve new rules from federal agencies. This will make it too hard to get anything done. Please Vote NO on S.J Res. 11, which would overturn the BLM Methane and Gas Waste Rule. The rule requires the oil and gas industry to reduce leaks on public and tribal lands by deploying widely accepted technology. Leaked gas has VOC, which causes asthma and cancer and can easily be captured. In addition, according to BLM, capturing this gas would lead to net revenues of 46 to 204 million per year. Please Vote NO on S.J Res. 11, which would overturn the BLM Methane and Gas Waste Rule. The rule requires oil and gas companies to reduce leaks on public and tribal lands by using proper technology. Leaked gas has VOC, which causes asthma and cancer and can easily be captured. The BLM says that capturing this gas could earn 46 to 204 million dollars per year. If a Senate version of the Honest Act H.R. 1430, which passed the House, is introduced please do not support it. The Act prevents the EPA from using any scientific research that is not publically available. This can hamper taking action in emergency situations where not all information is publically available; discourages industries from sharing confidential information with regulators; and creates massive conflicts of interest. If a Senate version of the Honest Act H.R. 1430, which passed the House, is introduced please do not support it. The Act prevents the EPA from using any scientific research that is not publically available. I do not understand why my government would want scientists to just research on the Internet. This will not allow them to do their job very well. This bill would require congressional approval for any new rule from federal agencies. No major regulation could take effect unless it is approved by both houses of congress. Please Vote No on Overturning the BLM Methane Rule S.J Res. 11. The rule has required oil and gas industry to reduce venting, flaring, and leaks on public and tribal lands by deploying widely accepted methane mitigation technology. If a Senate version of the HONEST Act H.R. 1430, which was passed by the House, is introduced to the Senate please do not support it. Many of the studies that form the backbone of public health standards include patient medical records. Allowing industries to give the EPA information that they know will be kept confidential is critical to the effectiveness of the EPA. This Act can hamper taking action in emergency situations where not all information is publically available, discourage industries from sharing confidential information with regulators, and create massive conflicts of interest. Attaining a liveable environment is good for our economy for it creates jobs and provides us with a healthy work force. Clean water and air are not partisan issues and neither is accepted scientific research. I urge you as a concerned US citizen to uphold our nations environmental and public health protection. DA Lion City is hosting an Earth Day Celebration on Sat April 22 - something for everyone! The mission of our earth day event is to inspire our members and their families to learn more about the state of our planet and to join our political actions for a) fighting the current administration’s destructive environmental agenda and b) promoting legislators that support positive environmental policies and legislation. Our event features speakers who will educate our members on the scientific, political, social, and economic challenges and triumphs surrounding protecting our planet. Following the speakers we will write post cards to our legislators (language provided) and then have a fun pot luck lunch and pool party. The Program is starting promptly at 10.30am. With more than 50 years’ experience in the communications industry in Asia Pacific, Ken Hickson is a leading sustainability advocate and author of six books, including “The ABC of Carbon: Issues and Opportunities in the Global Climate Change Environment.” As Chairman/CEO of the Singapore-based consultancy Sustain Ability Showcase Consultancy Asia (SASA), he manages public affairs, media relations, editorial services, as well as business/investment advisory services for a range of public and private sector clients. He is a regular speaker and writer on all aspects of sustainability and climate change, as well as an advocate for the switch to clean energy and energy efficiency. He has been an advisor and consultant to Government agencies in Singapore, notably the National Environment Agency (NEA) and Urban Redevelopment Authority (URA), and acted for many private sector businesses in green building, cleantech, clean energy and energy efficiency sectors, including Armstrong Asset Management, The Blue Circle, TEALE and BBP. Ken is a member of the Singapore Institute of Directors (MSID), the advisory council of Eden Strategy Institute and Fellow of the Institute of Public Relations Singapore (FIPRS). In addition to his business and consulting experience, he has worked as a journalist and editor, covering television, radio, newspapers, magazine and online media. He is a regular lecturer, speaker, trainer and moderator at events for many organizations and universities, including NTU, NUS, SMU and SIM in Singapore, and in Taipei for the Asian Productivity Organization (APO). Cord Briggs is a sustainability and Clean Tech professional with years of experience working as a Director for the top Environmental Non-Profit, Clean Water Action in Philadelphia Pa. During this time Cord designed and executed grassroots lobbying and policy campaigns at the municipal, state, and federal levels in order to pass legislation such as stopping new natural gas drilling in Pennsylvania state parks; protecting the drinking water of 117 million Americans under the Clean Water Act; and passing the first ever federal rules limiting methane from oil and gas operations. In Singapore, Cord is pursuing an MBA from NTU and is consulting for several cutting edge clean tech companies working in micro grids, energy storage systems, renewables, and energy intelligence software. Rebecca Kreutter was born in Seoul and grew up in Singapore, where she attended the Singapore American School. She received her B.A. in public policy from Princeton University with a concentration in environmental studies. Rebecca is part of a Master's fellowship program through Princeton and is studying climate policy, including climate resilience and the economics of climate change. Her work on "Econometric Drivers of Forest Change in India," which analyzed satellite data on land-use in India, won her a senior thesis prize. As a Gilbert S. Omenn ’61 and Martha A. Darling MPA ’70 Scholar, Becky is interested in the interplay of climate science, economics, and policy. She is working in the White House Office of Science and Technology Policy (OSTP) on climate resilience, climate data and tools, energy policy, and communications. Before that, Becky interned at the Regional Greenhouse Gas Initiative (RGGI) in New York. She completed her SINSI internship with the Office of Energy Policy and Systems Analysis at the Department of Energy, conducting research and comparative analysis on the climate and environmental footprints of the national transmission, storage, and distribution infrastructure.